This article was writen by Rachel Thomas and first published in Plus, an internet magazine which aims to introduce readers to the beauty and the practical applications of mathematics. Like NRICH, Plus is another part of the Millennium Mathematics Project. The original article can be found at http://pass.maths.org.uk/issue24/news/parking/ . You can keep up-to-date with the latest mathematical news from Plus by visitng their news section . According to Rickett, this dream come true for the parking-phobic may not be far off. He works for Roke Manor Research , a company developing a system called the Vehicle Parking Assistant , which uses a combination of radar sensors and cameras attached to a car to calculate the size and position of a parking space, determine whether it is large enough and calculate the optimum trajectory the car should follow to get into the spot. "It will say yea or nay, and then provide advice on how to park the car", Rickett told New Scientist . This is one step better than the parking aids currently available, which merely measure the distance to an obstacle and warn the driver if collision is imminent. The Radar group at Roke originally developed systems for defence applications, but are now applying the same technology to more urban battles, such as car parking and air traffic control. 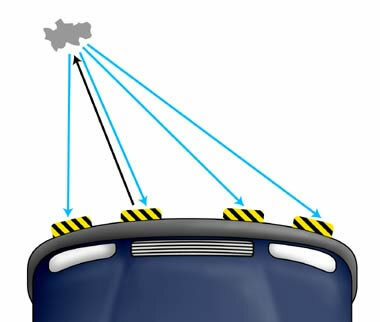 The key technique, called multilateration , is the combining of information from the network of sensors distributed around the car. For example, the four sensors across the front bumper each transmit a signal in turn, the signal is reflected by any obstacles in the vicinity (called targets) and is picked up by each of the four sensors, which are both transmitters and receivers. The time it takes for the signal to travel from transmitter to receiver depends on the distance the target is from each sensor. These measurements give the Parking Assistant a system of 16 non-linear equations involving the known coordinates of the sensors and the unknown coordinates of the target. It then solves the geometry of the target position (or gives an accurate estimate) and, combining this with information from the camera images, builds up a picture of the parking space.